The ShowerBaby® pays for itself by saving you money on baby wipes. Now, you can change diapers without wipes, saving more than $900.00 per child over the diapering years. 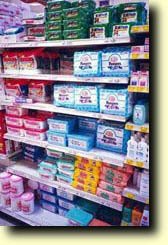 Fact: During the diapering years, babies can use over 7000 diapers and more than 31,000 disposable wipes.